Total Trading Daily Profit $9.50/sh - a great day indeed. ​​15.26 Near The Dead Cat Bounce ? 15.06 Update no 2 on Mind the GAP ? 14.05 Update on Mind the GAP ? ​​​13.10 Mind the GAP ? ​​12.01 Update on The iCahn Wrong Timing ? ​​11.25 The iCahn Wrong Timing ? Well, cheaper today Mr iCahn! ​​11.10 New Update on My Game Plan ? ​​10.39 Update on My Game Plan ? 10.26 My Game Plan ? ​​10.13 Update on Near ? Tested almost both side : SP500 being chrushed​..
​​​09.34 Let show us your strenght today ? 15.25 Obviously, he knows ( iCahn ) Something that I don t ! ​​14.25 Over the Target ? 13.13 Update on Near the Target ? ​​12.58 Near the Target ? ​The Dead cat bounce expected at $548.70 - almost there. ​​11.50 Unintended Consequences - Risks Factors ? 11.41 Update on Dead cat bounce expected ? 11.14 Another Dead cat bounce expected ? ​​10.34 Dead cat bounce expected ? ​​10.28 Update on Failed ? ​​10.01 Update on The Fatigue Experiment ? 09.48 The Fatigue Experiment ? ​​09.40 Update Where s iCahn Now ? ​​​09.33 Where s iCahn Now ? ​​13.44 Update on The iCahn Channel - Timber ? 13.22 The iCahn Channel - Timber ? ​​13.03 The iCahn Channel ? ​​​12.02 The iCahn Range ? ​​11.28 The iCahn Fade have Begun ? ​​​11.08 Update on The iCahn Experiment ? ​​10.58 The iCahn Experiment ? ​10.47 The New Range ? ​​10.42 Range Break Out ? ​​10.25 Still The Range ? ​​​​​​​​​09.52 New Update on The Resistance ? ​​09.39 Update on The Resistance ? ​​15.15 Update on The Fade have Begun ? ​​​14.14 The Fade have Begun ? ​​13.01 Update Double Top ? ​​11.10 Mind the Gap ? ​​10.57 Another Update on Consolidation Phase ? ​​10.45 Update on Consolidation Phase ? ​​10.26 Where the Support ? at $542.90​​ - first reach tthere its a buy dead cat bounce... to $545.50? ​​10.15 Stopped and Miss ? ​​09.52 3rd Resistance, 2nd Test ? ​I think here will consolidate between $547.50 and $549.30 before resuming ​downtrend... $545.50 zone double test the support level? 09.36 Second Target Reached ? 09.33 Opening Dead Cat Bounce ? ​​16.00 Totally Missed to Forecast the Bottom ? Think we will have a huge Dead Cat Bounce on Tuesday - $545.50 min ? ​​15.32 The CSSSC PTS Triggered ? ​​​​15.13 The China Syndrome Scenario Sequence Completed ? ​​​15.54 The China Syndrome Scenario ? ​​​14.37 Update My New PTS ? ​​​14.27 Update My New PTS ? ​​14.15 My New PTS ? ​​​13.56 A dead Cat Bounce ? ​​13.52 Meet me at the Ultimate Level ? 13.47 Wave 2 on The Bleeding Scenario ? ​​13.30 The Bleeding Scenario ? ​​10.40 The Alternative Scenario ? The way it trade, I think we will be chopped both ways. 09.52 Update on A Dead Dead Cat Bounce ? ​​​​09.44 A Dead Dead Cat Bounce ? 09.37 Dead Cat Bounce ? ​​11.42 Still Into the Channel ? 10.46 Fatigue on the The Hope Trade ? ​​10.21 Update on the The Hope Trade ? ​​10.09 The Hope Trade ? ​​​09.43 Update on the Second wave the real one ? ​​09.37 Second wave the real one ? 09.33 The Day After ? ​15.05 Almost Stopped on the Tiny Bleed Wave ? ​​14.22 Another Tiny Bleed Wave ? ​13.50 The Bleed have Begun ? ​​11.35 Update on Stuck in the Mud Range ? ​11.09 Stuck in the Mud Range ? ​​10.40 Update on Correction in Progress ? ​​10.24 Correction in Progress ? 10.11 Second Resistance Phase ? ​09.51 Update on First CHL Resistance ? ​​​​​09.39 First CHL Resistance ? ​​15.10 Last Call on The Ultimate Level ? ​​​14.07 Update on The Ultimate Level ? ​​13.03 The Ultimate Level ? 11.21 The Broken Wall ? Trading back towards $541.00 will mean to me technical weakness..
10.17 Update on No Momentum Break Out ? ​​10.14 No Momentum Break Out ? ​​09.59 Update on The Range ? Well already tested both side of the Range. ​​15.44 Dead Cat Bounce No 4 ? ​​15.27 Dead Cat Bounce No 3 ? ​​15.17 Ugly Daily Candle ? 15.06 Dead Cat Bounce No 2 ? ​​14.50 New Update on the Slippage Risks ? ​​​14.26 Update on the Slippage Risks ? ​​​13.14 Thanks fo your Support ? ​​12.25 Update on the Fourth Resistance Line ? ​​11.39 Fourth Resistance Line ? I thought a range trade earlier but keep grinding to the fouth resistance level. 10.41 Range Trade from Here ? ​​10.35 A Brand New PTS ? ​​​10.16 Update on the 3rd resistance trendline ? ​​​​10.01 Already on the 3rd resistance trendline ? ​​​​​09.40 Strong Opening = Weak Trading ? ​15.27 Out of the Dead Cat Bounce ? ​​15.12 Finally the Dead Cat Bounce ? ​​13.15 No Cat No Bounce No Lunch ? Well , was expecting a Dead Cat Bounce for Lunch... still waiting! LOL! ​​11.43 Dead Cat Bounce for Lunch ? 10.43 Mind the Gap - Part 2 ? We had two broken levels this morning. The risky trade here is buying at $532.70 with a $531.00 stop. ​​10.11 The Perfect Storm ? ​​​​09.48 Mind the Gap ? ​​​09.43 My Broken Dream ? 09.34 Strong Opening = Weak Trading ? ​16.05 Daily Bearish Engulfing Pattern Confirmed ? See second chart below - ellipse. ​​​15.44 My Daily Bearish Engulfing Pattern ? ​​​14.49 Update on : $537.20 to Watch ? ​​14.14 $537.20 to Watch ? ​​​11.33 Near the Abyss ? 11.12 On a Trendline Support - Finally ? ​​10.48 Dead Cat Bounce ? ​​10.09 New Game Plan ? ​​14.10 Near the Abyss ? 12.23 A Nasty Channel ? ​​11.23 Update on My Broken Trend ? ​​10.49 My Broken Trend ? Reached almost the second target of $546. ​Went close to the $538.80 level - close enough for me. ​​​​​09.35 Good Is Really Not Enough ? ​First real support is $538.80. ​​14.35 Euphoria Phase 2 ? Is that only market driven ? Apple Counter Trend vs the Market ? ​​13.32 Capitulation Followed by Euphoria ? ​​12.42 My Dear Resistance Trendline ? me that the Bear squeeze will continue til the end of the session...$546.00? ​​​11.15 Thanks for Your Support ? ​​10.11 The $536.50 Magnet Experiment ? ​​​10.02 Second Attempt Failed ? ​​​09.52 Second Attempt and 3$ to Go ? 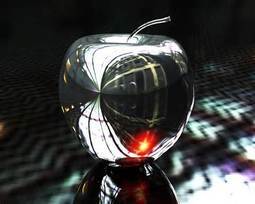 ​​09.37 First Test Rejected ? 14.02 First Real Dead Cat Bounce of the Day ? ​​​12.34 The China Syndrome ? ​​10.33 Where s the Support Level ? ​​09.53 Thanks for Your Support ? Well $548.60 was broken like nothing was there. ​​14.45 Get Me Back Into My Tiny iChannel ? ​​​12.48 Update on My New Tiny iChannel ? ​​11.51 My New Tiny iChannel ? ​​​11.11 Update on Support of my iChannel ? ​​​10.20 Update on Support of my iChannel ? Price action is just awful​. ​​​09.57 Test of Support of my iChannel ? ​Traded exactly $553.20 and started to bounce back painfully. ​​​09.40 Classic Strong Opening and Fade ? 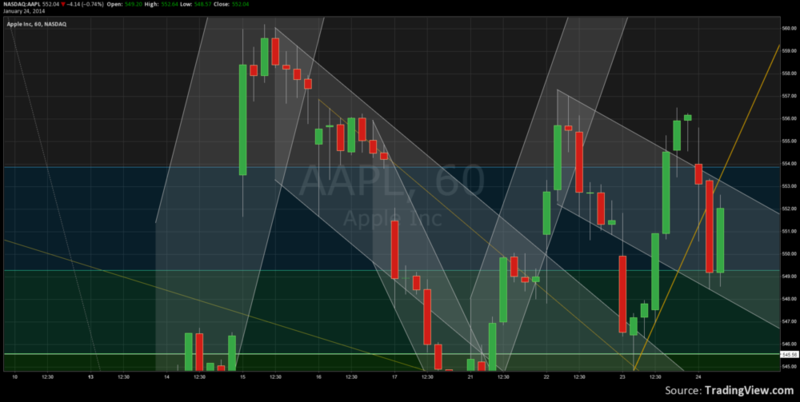 ​​A classic uptrade at the opening, but should bleed towards $553.20.